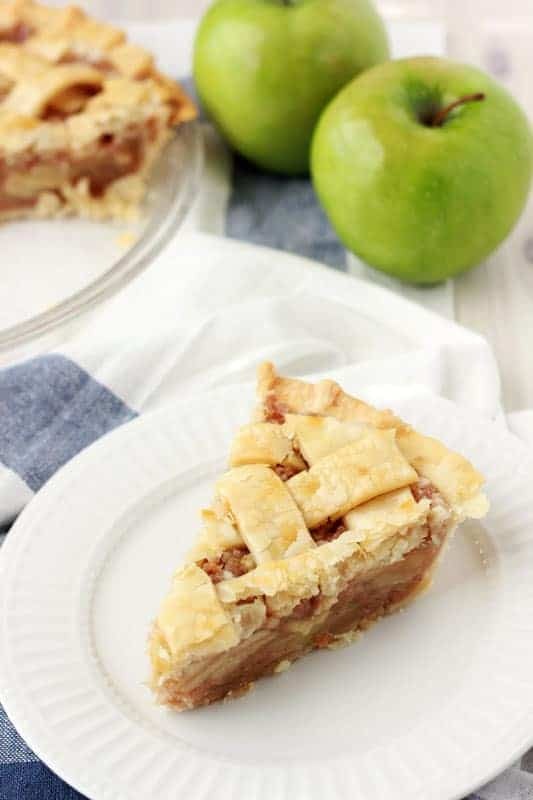 This Caramel Apple Pie transforms the classic fall dessert by adding caramel and bits of toffee! 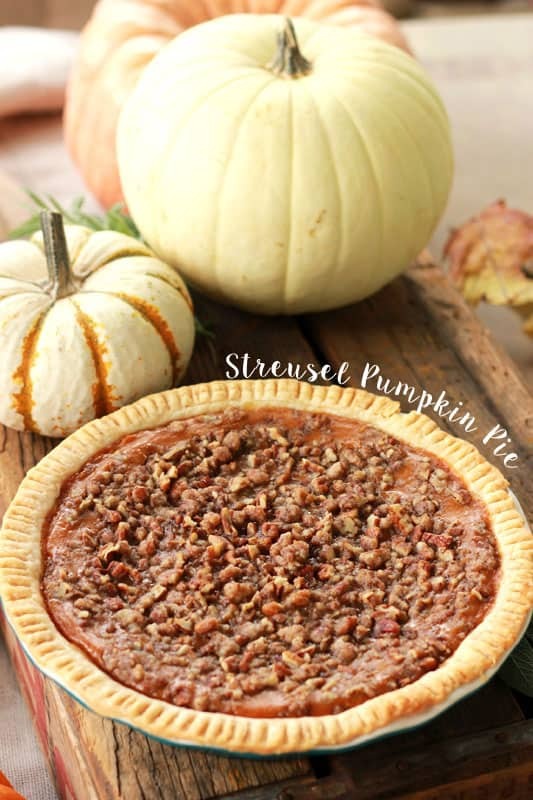 Perfect for in-season produce and Thanksgiving treats! Today we are going to talk about PIE. It’s made an apperance on the website a couple of times but never like this. 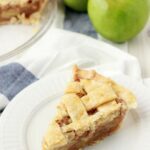 While regular ol’ pie varieties are always welcome in my home (and belly) I want to get out of the box this year! I’m starting with all of the classics and giving them a facelift! Apple seemed like a good place to start since the produce is in-season and what better way to compliment the flavor than with caramel?? True story, I have a soft spot for caramel apples. Waaaaaay back in the day (which was a Tuesday, by the way) I was super preggers and craving all of the bad things to eat. My husband had a genius idea to introduce me to Rocky Mountain Chocolate Factory where I fell head-over-heals in love with their vast variety of caramel apple flavors. Over time we tasted each one eventually I decided that the apple pie was my fave. Flash forward to today… Whenever we have a special event to celebrate we always split an apple. It’s a special little memory that makes us appreciate how lucky we are to have each other (and our little guy). 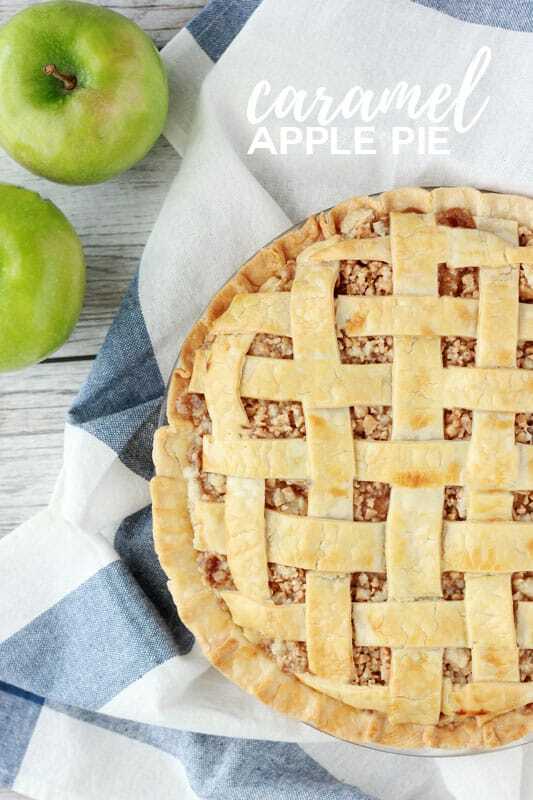 For this pie you are going to want to use tart apples like granny smith. We’re going to cook them down with sugar to create a caramel and the tartness really off sets the sweet in all the right ways. Check the photo below to see how stunning that filling looks once the apples are soft and the caramel is covering every last slice. Feel free to drool. From start to finish you’re looking at about an hour. 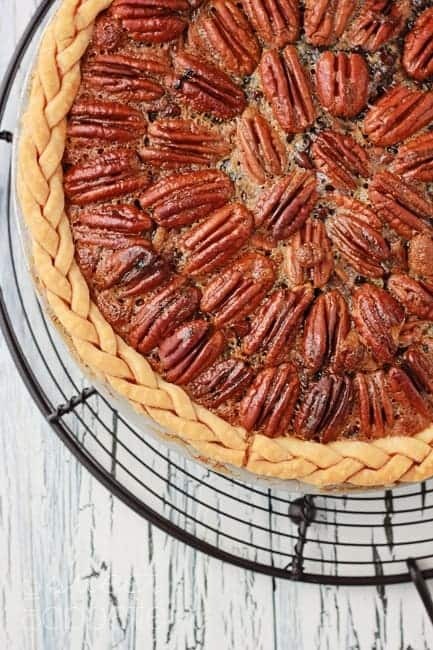 I suggest having your pie crust ready to go so you can pour this right into the unbaked shell after cooking. That caramel goodness hardens up fairly quickly so you want to be sure to get as much as possible into that dough. And don’t skip the toffee bits! That added crunch really sends each slice over the top! Split your pie crust into two equal parts. 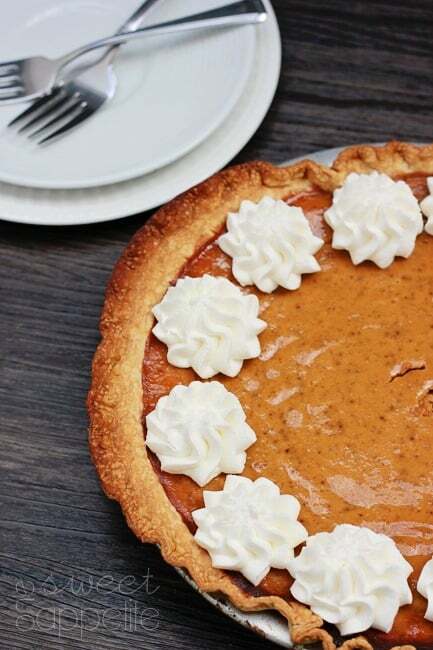 Roll out one half out into a 10-12 inch circle and place into your pie plate. Trim the edges. Preheat your oven to 450 degrees. 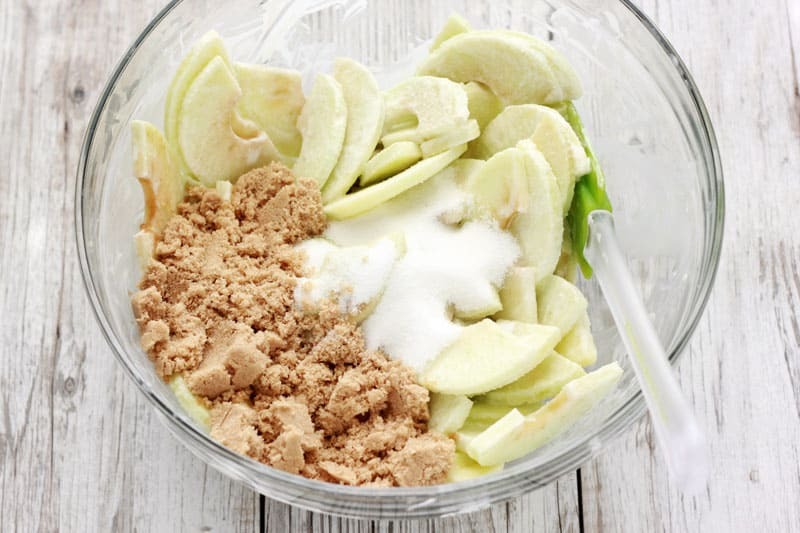 Stir together your apples, lemon juice, heavy cream, vanilla, brown sugar, 1/2 cup sugar, 1/2 cup flour, cinnamon, nutmeg, and salt in a large bowl. Melt four tablespoons of butter in a medium sauce pan. Add your apple mixture and cook for 10 minutes, or until your apples are softened. Pour into your prepared shell. 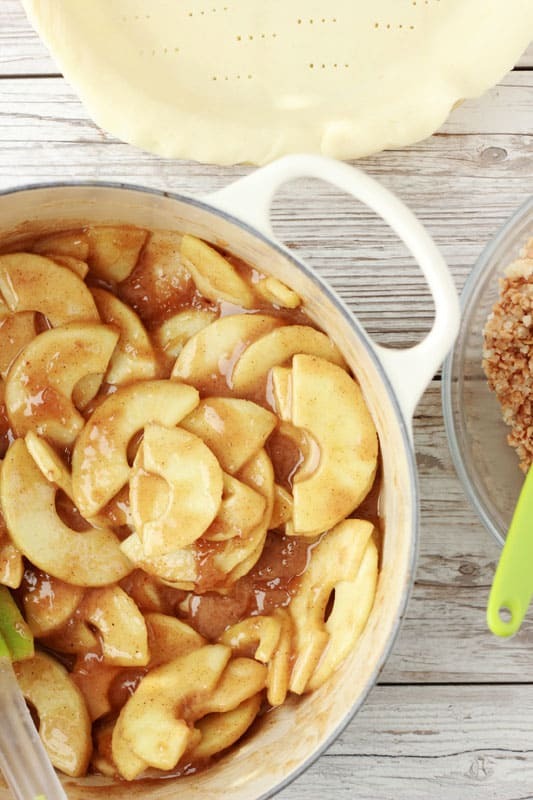 While your apples are cooking, stir together 3 tablespoons of sugar and 1/4 cup of flour. 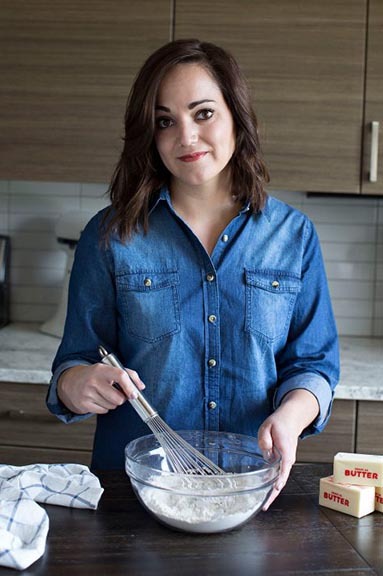 Melt the remaining two tablespoons of butter and mix into your flour. Stir in the toffee bits and sprinkle evenly over your pie. Roll out your top crust and place over your pie. Cut slits for ventilation, brush with an egg wash, and sprinkle with sugar. Bake your pie for ten minutes. Reduce the heat to 350 degrees and continue baking for 40 minutes, or until golden.